Is Google’s Project Ara the Future of Smartphones? Recent buzz on the street regarding Project Ara and the Spiral 1, the newest smartphone evolution from Google Inc (NASDAQ:GOOGL, NASDAQ:GOOG), is that handsets will become available this year, with the first round of retail offerings set for Puerto Rico. A firm release date hasn’t been announced, but GOOGL apparently chose Puerto Rico as the launchpad for the first iteration of its modular smartphone because 75% of the country’s Internet access is via mobile devices. Fans of the design are on the edges of their seats, ready to jump at the chance to own the first completely customizable smartphones ever built. Critics are also pacing with anticipation, even if they are just waiting for that perfect “I told you so” moment. If you’re not on the cutting edge of technology, you may not have heard much about Project Ara or the Spiral 1. Surprisingly, there hasn’t been a slew of advertisements for GOOGL’s latest creation. But, for millions of industry insiders, geeks, and techies, Project Ara has been a topic of speculation and debate since it was first announced a year ago. On the surface, the concept of a modular smartphone is intriguing and full of potential. The idea is intended to give consumers nearly compete control over the features — and the cost — of their new mobile device. Akin to LEGO building blocks, individual components for GOOGL’s new device would conform to specific dimensional criteria and attach to a universal frame base. In theory, if a component became damaged, obsolete, or if the consumer simply wanted an upgrade, the bulk of the device would remain intact while the offending piece was replaced. 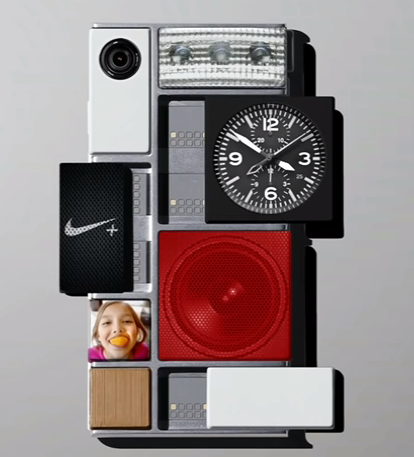 Project Ara has the look and feel of a major game changer for the mobile industry. Project Ara: Will It Fall to Pieces? Critics of Project Ara have cited some realistic hurdles that GOOGL might face if its modular smartphone is to realize any legitimate success in the marketplace. Let’s consider some of the more valid points, challenges, and plausible scenarios. Software compatibility will be a nightmare. Today’s smartphone OEMs spend countless hours tweaking their software to provide top-notch performance using carefully selected integrated hardware. Opening the door to potentially hundreds of new modules will undoubtedly lead to incompatibility issues stemming from conflicting hardware, ultimately leading to poor overall performance (or, worst case, a very expensive paper weight). The phone will be bigger and heavier. Since the module design incorporates an aluminum frame with eight slots for hardware on one side and the screen on the other, the complete phone will be slightly heavier and thicker compared to today’s leading models. Current Android OEMs stand to lose business. If GOOGL is successful in mass marketing the Spiral 1, OEMs such as Samsung Elect LTD (OTCMKTS:SSNLF) and LG Display Co Ltd. (NYSE:LPL) would lose customers. Since Project Ara is open source, meaning that any company with the means to develop new hardware modules will be free to do so, the current big dogs in the Android market could have a tougher time rolling out their own new models. Sure, they could start developing their own, but that would mean shifting focus from the bread-and-butter $600 handsets in exchange for tiny plastic squares that would sell for a fraction of the cost. Supporters of Project Ara have countered the points made above, and many predict that GOOGL is on the verge of disrupting the entire mobile industry. Let’s take a look at a few of the major points in favor of a modular design. Complete customization options. Owners of the Spiral 1 will be able to swap out any of the existing hardware modules with ones more suited to their individual needs and preferences. For example, amateur photographers could replace the Spiral 1’s camera with a higher-resolution model. Imagination has no limits. Because Project Ara is open source, a host of niche modules could be created to serve a near-infinite number of possibilities. New hardware could easily be installed to provide consumers with tools such as health monitors, image projectors, glucose sensors and the like. Much more affordable devices. The modularity of the design means consumers won’t get stuck paying for features they don’t need or want, as is often the case with today’s smartphones. GOOGL has announced an expected price of just $50 for the base model Spiral 1, meaning consumers who have yet to graduate to modern-day mobiles will have a much easier time thanks to the low price point. With this business model, the cost of upgrading a smartphone decreases dramatically, as only certain hardware modules would need to be replaced. Personally, I’m a fan of the modular smartphone concept and I hope that a solid working device is available soon. GOOGL has partnered with several top-notch companies to beef up the base model device, and it speaks volumes when you consider that NVIDIA Corporation (NASDAQ:NVDA) and Marvell Technology Group Ltd. (NASDAQ:MRVL) will provide the processors for these modular smartphones. Also, GOOGL is getting the Spiral 1’s batteries from an MIT-based start-up company, SolidEnergy, which recently announced successful development of a new lithium-ion battery capable of twice the power of current leading mobile device batteries. Clearly, with a $50 price point, GOOGL is not targeting the high end of the smartphone spectrum, so I doubt that AAPL is very concerned at this point. Android dominates the low-end mobile device market, and the Spiral 1 could further solidify the tech giant’s hold. Project Ara will also create an opportunity for smaller companies and developers to get their designs out to the masses when GOOGL opens its online module store. Overall, Project Ara has immense potential to change the mobile landscape and put modern communication devices into the hands of consumers who couldn’t previously afford them. The modular design concept will take hold, and within a few years we’” probably all be building our own smartphones.